Olivas Links, was again, voted top Municipal Golf Course from Golfweek Magazine for 2009-2014! Olivas Links offers a natural golf experience unique to Ventura County. The rustic tranquility of Olivas Links transports players to a place where the competition is between man and nature. Olivas Links showcases views of the Ventura Harbor, Ventura hillside, and the Channel Islands. Owned by the City of Ventura, Olivas Links provides golfers with the opportunity to play in a temperate climate with coastal beauty. With four distinct sets of tees, Olivas Links challenges players of all abilities, offering various shot-making options. 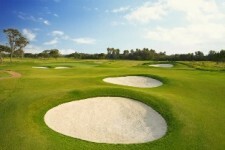 The practice facility is an acre and a half grass tee, with five bunkered target greens. A pair of bent grass greens allow players to practice a variety of short shots and a putting surface that deliver a true roll and consistent speed. Visit our contact page for a helpful list of emails and phone numbers to help make your experience at Olivas Links the best possible.